Essentially, these factors along with a healthy diet and regular exercise help keep your cholesterol levels in check. However, in order to effectively target all 6 factors…some people resort to pills, drugs and overhyped vitamins to help manage their cholesterol, some often coming with associated side effects or just no benefit at all, while others only target one or two of these 6 factors. In order to give your body the nutrients and ingredients it needs to address all of these factors, you should consider Lipi-Rite… a unique, comprehensive supplement to help support healthy cholesterol levels naturally. The reason why we raise this is that we often find out from customers that they really may not need to be taking anything for their cholesterol, either medications (usually statins) or natural supplements. For this reason, we encourage you to be fully aware of your cholesterol profile, including your LDL (Low-density lipoprotein) /HDL (High-density lipoprotein) ratio. Lipi-Rite is provided in soft gels which allow us to provide a unique blend of ingredients in their most effective powder and oil forms. The ingredients in the Lipi-Rite formula have been combined in a synergistic way. In other words - they combine to make the whole greater than the sum of the parts. Lipi-Rite may be taken independently – however, this cholesterol-balancing formula is designed to work with the Core Wellness Activators. To learn more about Core Wellness Activators – click here. Lipi-Rite has been formulated to only include ingredients with well-established safety and strong evidence that it supports the maintenance of a healthy cholesterol profile. You can click on any of the ingredients listed below for more information about how the ingredient contributes to the efficacy of the product and why we include it. Other Ingredients: Capsules (Gelatin, Glycerin, Water, Titanium Dioxide, Yellow #6, Red #40, Blue #1), Ethanol, Water. Serving size: Men or women - 2 soft gels. For optimal results take 2 soft gels 30 minutes prior to your evening meal. The dosage can be doubled to 2 servings per day for the first 2-3 months. If taking 2 servings per day, take the first serving in the afternoon and the second serving before your evening meal. Combines well with our Omega 3 Fish Oil products, Total Balance, and Cardio-Support. 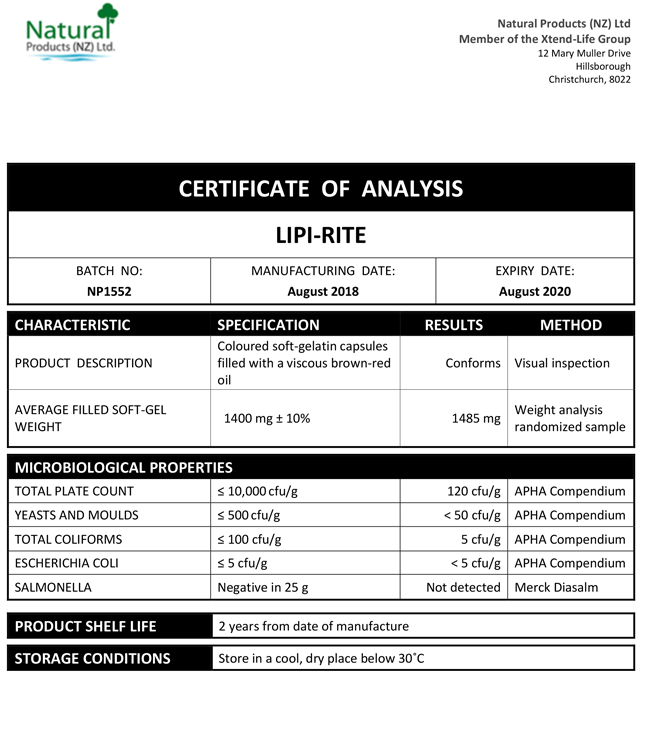 We have included below a copy of a typical Certificate of Analysis (CoA) for our Lipi-Rite product. You will note that there are two columns which are headed 'Specification' and 'Results' respectively. The specifications are simply our minimum standard to which each batch of Xtend-Life Lipi-Rite has to conform, otherwise we would not release it. The results are the actual results from the independent laboratory that did the testing. How does Lipi-Rite compare to statin medication? Statins work to reduce your cholesterol level. That is all they do. They achieve this in a forceful way; hence a variety of detrimental effects may be experienced by some people. Because they work in such a forceful way, when you stop and start taking them, huge fluctuations in your cholesterol levels may result. It is akin to the negative effects of starting and stopping smoking and the addictive, damaging affects this may have on the body. It is also important to remember also that a cholesterol level that is too low is just as dangerous as one that is too high. Statins do not work to compensate for this. They simply try to eliminate cholesterol - which is dangerous. Immediate effects are noted when using a statin drug because of its forceful and aggressive nature, but long-term benefits are not gained. Lipi-Rite, on the other hand, works in a completely different way. The formula recognises the absolute necessity to 'balance' a person's cholesterol level in a manner that fits their individual requirements. Therefore it acts to encourage the body to find its own natural cholesterol balance, which may differ from person to person. The goal of Lipi-Rite is to achieve a long-term balance of the cholesterol levels, not a short-term and artificial fix. As this product works with the body and is naturally based it will take longer to work, but this is not a negative factor. It enables the body to heal properly, with longevity in mind. Will Lipi-Rite help lower my triglycerides? Lipi-Rite may help support the healthy management of triglycerides…however, if you want additional support, you should combine this with our Omega 3/DHA fish oil as part of your supplement regime. Can I stop taking the statin drug prescribed by my GP and use Lipi-Rite? This is a question that can only be answered by consulting with your doctor. Explain to them that you would like to try a natural product to assist with managing your cholesterol levels. Talk to your doctor about starting two soft gels per day of Lipi-Rite and cutting your statin dose down gradually. If your levels have remained balanced, then you may be able to ask your doctor if you can drop off the statin drug altogether. Thereafter, your doctor may only need you to have periodic cholesterol tests. Lipi-Rite containing wholly naturally derived ingredients. We have expertly formulated the ingredient specifications to ensure that Lipi-Rite delivers maximum benefits. Why have my cholesterol levels gone up since I started using Lipi-Rite? As this is a naturally based product, it will work differently for every person and results cannot be guaranteed or predicted. A rise in total cholesterol levels can be experienced in the first few months of using Lipi-Rite, as the body works to find its natural balance. This should level out again after four to six months. We would advise having a blood test firstly after three months and then after six months to assess the change in levels. If your levels are still higher after six months we would advise speaking with your doctor. It is important to consider the whole cholesterol level reading, not only the total cholesterol level. The level of HDL and LDL cholesterol and the relationship between these is an important factor as well. Your doctor will be able to advise you on this. A rise in levels when beginning Lipi-Rite also may occur if you have been using a statin drug within the last six months. This is due to the forceful nature in which these drugs work; we advise persevering for at least six months and then see your doctor for a check-up. What is the best time to take Lipi-Rite? As Lipi-Rite works to help naturally balance cholesterol levels the best results will be achieved if it is taken about thirty minutes prior to your evening meal. This is because cholesterol absorption occurs in the body mostly in the evening, so we advise taking as directed where possible. If you forget or cannot take it 30 mins prior to your evening meal, aim to take it sometime in the evening and at least 2 hours prior to bedtime. How long will it take Lipi-Rite to work? For best results, we suggest that you follow our 'recommended protocol' suggestions. It is recommended that Lipi-Rite is taken for at least 90 days at the rate of 2 soft gels per day and combined with a healthy, balanced diet and regular exercise. As this is a naturally based product, the benefits will vary for each individual and the results may be subtle. We would advise taking Lipi-Rite for a minimum of ninety days and then visiting your doctor to receive a follow-up blood test to check for any changes in the levels. Additional benefits may also be gained from using our Omega 3/QH Ultra in conjunction. I noticed that one of the ingredients in Lipi-Rite is Policosanol, sourced from sugar cane; will it raise my blood sugar? Even though the ingredients policosanol in Lipi-Rite comes from natural sugar cane it will NOT raise blood sugar levels and is safe for you to use even if you suffer from blood sugar imbalances. Why is a food colouring (Titanium dioxide, Yellow #6, Red #40 and Blue #1) used in Lipi-Rite? These colours are only in the soft-gel, not the oil blend itself. The colouring makes the soft-gel opaque so the inner liquid formulation is not visible when taking the product. The oil blend is a dark reddish or brown colour which some people may perceive as off-putting. What else can I do to help balance my cholesterol levels? As well as using Lipi-Rite, it is crucial to ensure your diet and nutritional intake is of optimal quality in order for the best possible reduction in your cholesterol levels. This should include a good balance of whole, natural foods and drinks, including lots of fresh vegetables and fruits. It is important to ensure that your intake of Omega 3 essential fatty acids is adequate as well. Our Xtend-Life Omega 3/DHA Fish Oil formulas are excellent for this. Our Total Balance products also contain many potent nutrients that will help support the health and function of your cardiovascular system. If you add Xtend-Life Total Balance to your supplement program along with one of our Omega 3/DHA fish oil products you will be supporting your body's ability to manage a healthy cardiovascular system, general health and long-term wellness. Foods containing vitamins C, E, beta-carotene, chromium, copper and those rich in lycopene are all beneficial for cardiovascular health. Including some soy products for their isoflavone content is also a great support to your heart and circulation. Foods high in soluble fibre are helpful as well, such as brown rice, wheat bran, oat bran and psyllium. Exercise is, of course, important to keep your heart and circulation in peak condition. Even moderate exercise, such as a 30-minute walk each day, some weight bearing exercise during your week and some relaxing exercise such as yoga or swimming, can be enough to help keep your body in order, both inside and out.